The stretch of beach I was working on is known for four species of sea turtles: leatherback, loggerhead, green, and hawksbill. They are all endangered or critically endangered animals. 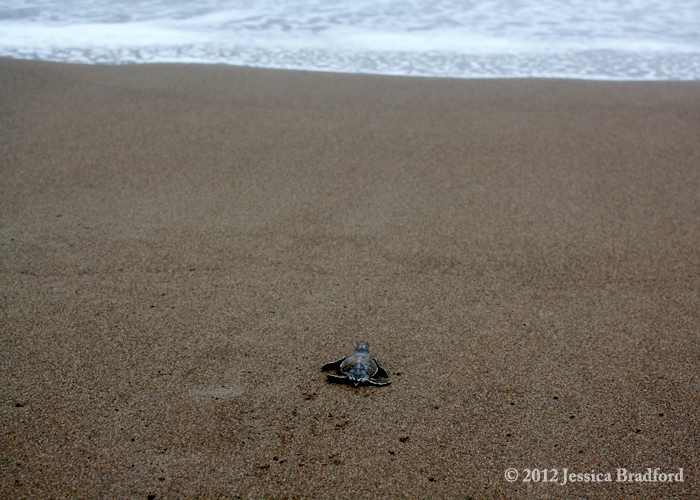 While I was in Costa Rica, I saw green and hawksbill turtles. In attempts to protect and learn more about these species, volunteers are responsible for conducting night and morning beach patrols. During night patrols, we would find adult female turtles emerging from the sea and observe their activities. If they selected a nest site, we would stay with them until they returned to the ocean. Once laying eggs, we counted them as they dropped into the egg chamber and recorded nest location data. This doesn’t disturb the turtles because they go into a trance when laying. When finished, the turtle is measured, tagged, and checked for abnormalities. Although these massive, ancient animals aren’t incredibly graceful on land, it was fascinating to watch them emerge from the sea under moonlight and engage in the same reproductive behaviour they have for millions of years. Some turtles would be covered in bioluminescent algae and you could make their carapace illuminate by touch. I feel lucky to have shared such experiences with these beautiful animals. Morning patrol consisted of monitoring the beach for turtle activity from the prior night. 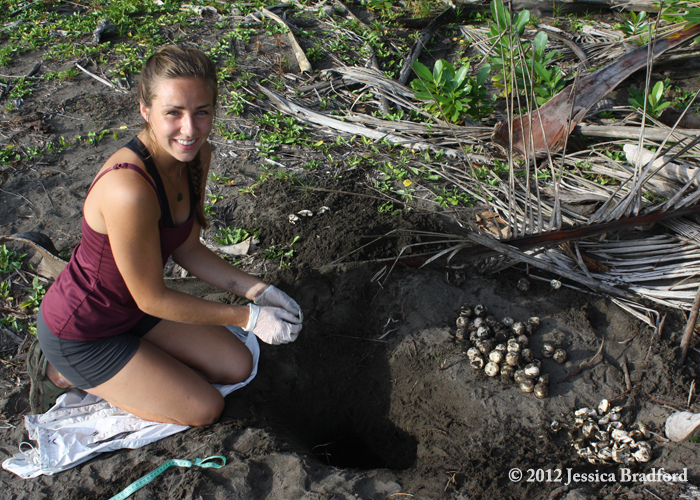 We were also responsible for excavating nests two days after hatching, meaning we would dig up a nest and count the number of hatched / un-hatched eggs to determine nesting success rates. Sometimes, we would find straggler hatchlings that didn’t make it out of the nest. During my first excavation, we found 26 hatchlings. We took them closer to the water and let them run along the sand to where they belong – the ocean. 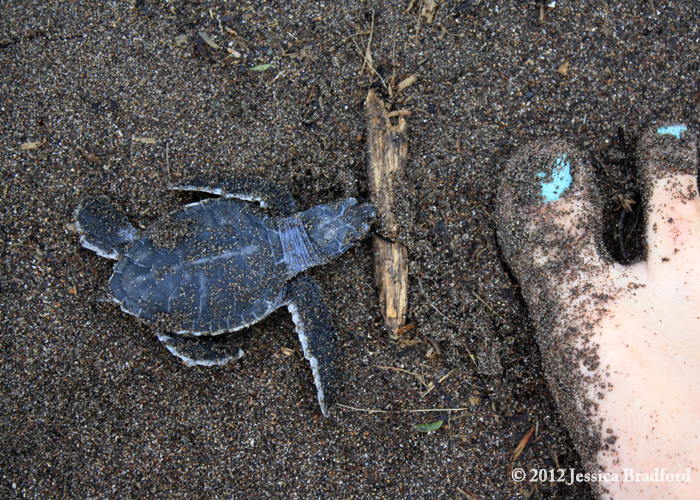 The chance of survival for hatchling sea turtles is pretty slim. Every time I came across a tiny hatchling, I felt I was helping to increase those chances just a bit.